Today we have a very special figure from the Masters Of The Universe Classics action figure line from Super7. 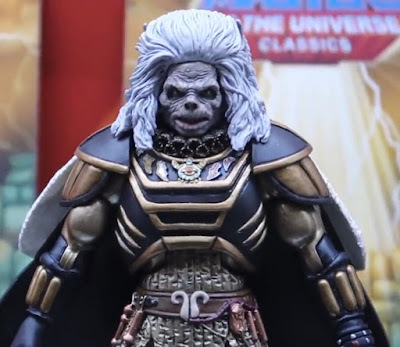 Karg is the first action figure from the 1987 Masters Of The Universe film that wasn't a figure from the vintage line and from what we just found out from the 2019 New York Toy Fair he won't be the last. 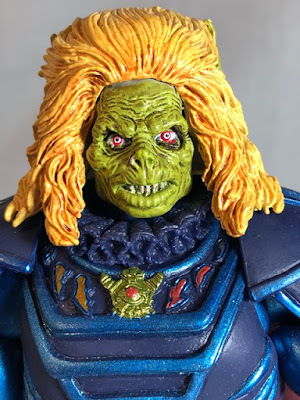 First off I have to say that Karg looks good, a great job by the sculpture. 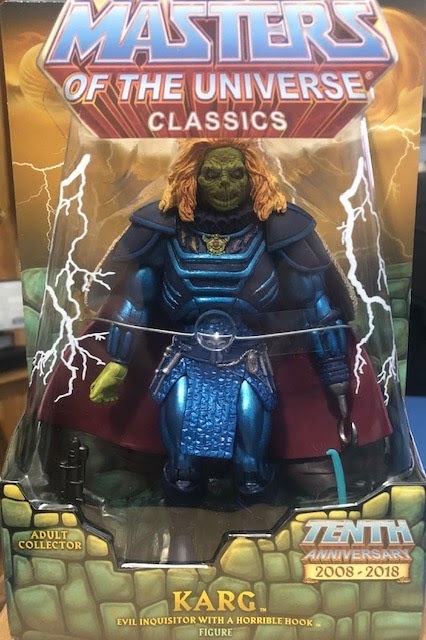 When I first saw him I didn't understand why he had a green face and blue clothes but I found out that this Karg figure was based upon his appearance in the MOTU movie comic book and not the movie itself. This is the movie version of Karg that will be out sometime in 2019. As far as accessories go Karg gets two, a gun and a hook thing. Karg didn't have this gun in the movie but it was used by Skeletor's troops. I also happen to have one of the props from the movie so I'm happy that I have a version of it for the MOTUC line. 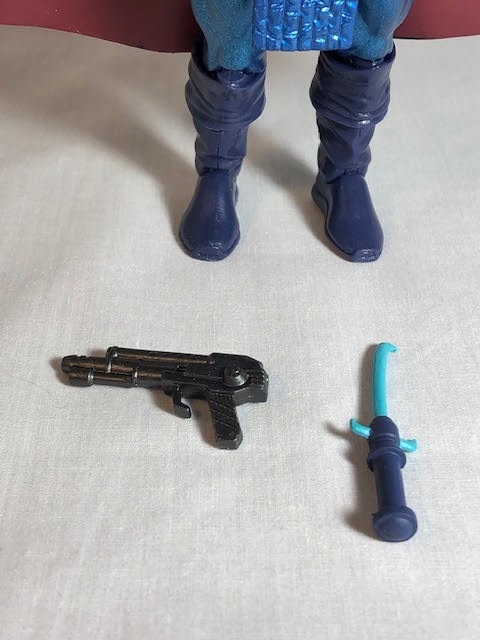 Hopefully, they will release some of Skeletor's troops to go with the gun. My problem with this figure is that his feet and ankles are pretty loose and with his heavy upper body I had problems standing him up. If I'm careful I can get him to stand so this isn't the end of the world. Luckily his loose feet are really the only issue I have with this action figure. I always thought that Karg was a small character, not as small as Gwildor but smaller than the other bounty hunters. I popped the movie in to compare and Karg's hair is pretty much level with Saurod's head so there you go. 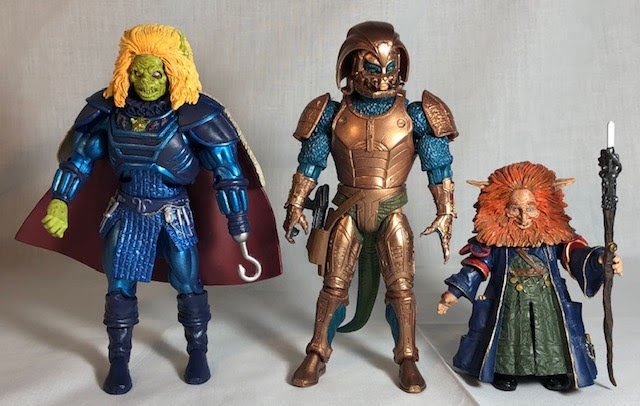 Overall I'm very happy that Super7 was able to make a brand new figure from the Masters Of The Universe movie. 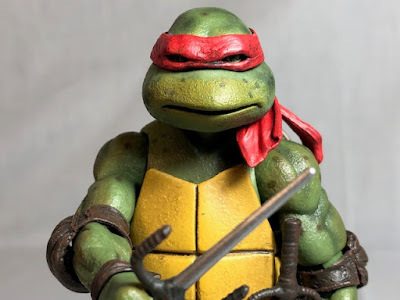 My only real problem with the figure, besides being able to stand on his own, is that he is based upon his comic book appearance so he has a green face, yellow hair, and blue clothes but I'm more ok with it now that the movie version is on its way. I have to give Karg (Comic Book Variant) a 7 out of 10.